Dr. Kelly Miller Smith, Sr. termed those college students who studied non-violence with the Rev. James Lawson “the children” because they were all in their upper teens or young twenties. They were children. David Halberstam, the award-winning former Tennessean reporter, “covered” the “children” as they prepared in school and church basements and later went downtown Nashville with them to the lunch counters. He would later write the Pulitzer Prize winning book, The Children, detailing just how a miracle such as Nashville happens. Essentially, a small group of African American leaders decided that the time was right to begin southern desegregation. After James Lawson returned from spending time with Mahatmas Gandhi in India, the leaders felt that the professorial Lawson would be the one to instruct southerners in the principles of non-violence. They had considered Atlanta, but the Atlanta Constitution wasn’t deemed strong enough to publicize the movement, and the Tennessean was judged to be ready for that task. Nashville was also not as deeply against segregation as more southern states were, and offered a good opportunity for success. So James Lawson showed up in Nashville in 1960, ready to teach “the children” and be taught at Vanderbilt’s Divinity school where he was pursuing his Masters’ degree. He wouldn’t get it then and Vanderbilt kicked him out of the school when he couldn’t play by the “gentlemen’s agreement” to stop his work with the area students. In a sense, I was raised up with the Movement and continued to learn about the need for equal rights everywhere I lived throughout the south. In Memphis, I witnessed my mild-mannered grandfather become poisonous when he shouted against those “G-D-N” and if you don’t know what that means, you haven’t lived in the south for long. I was in the room when a close family friend from church called to say that Dr. King had been shot and killed in Memphis and she gleefully told my brother what a good day it was. I lived in Mississippi in the early 1980s when many white families of modest means still employed non-white maids. In Nashville, I’ve had to explain to my son why mostly black people live in the projects that we pass as we go home from church. The only life I’ve known has been a life of trying to piece together what “the children” and others, like Dr. King did, what I must do in response, and how the long painful road towards integration keeps getting extended. That I’ve spent my entire work life teaching at a college that’s located on a former plantation reminds me of how I truly “own” the “white man’s burden” as Dr. John Claypool once called this whole post-slavery mess – I live in a society that is still trying to live with one another, often ignoring the reality that a large population with less resources, skills, education, and rights are those of a different skin color. I am not sure if the country has ever found its way after the tumultuous 60s. Last year I delighted in chanting “yes we can” with much of the nation, but I’m afraid that we need some help in remembering the vision that Dr. King called us to almost half a century ago when he reminded us that there was a mountaintop from which we could imagine a new country, a better country. We need to remember the “children,” like Diane Nash who once told her fellow Nashvillian John Seigenthaler, legendary Editor Emeritus for the Tennessean and then a high-ranking staff member for Bobby Kennedy, that she and the other children were going to Birmingham, even though it could mean possible death for them all (and a considerable embarrassment for the Kennedy administration). Nash told Seigenthaler, “Of course we understand the danger, Mr. Siegenthaler. Last night we all signed our wills.” She and the others lived through the Nashville storm and were walking willingly into the next one. Discrimination is now widely accepted as wrong but no one denies it’s not still there. Racial relationships are much better than fifty years ago, but we are still dwelling in “a winter of discontent” as Dr. King would say. Now as a white daughter of an economically segregated nation, I realize that I have a dream, too. No one “handpicked” me to initiate a social change as some picked Lawson, but I do feel a responsibility to offer what I think is life-giving to those who desperately want to change the world. There’s a lot that needs to be changed. Our country is fighting multiple wars, both off our soil and in our legislatures. The welfare and legal rights of immigrants, refugees, and those largely considered as “other” in our country are still not equal to those who were born on American soil. Those who have less money have less healthcare than those with more money and power. That’s the short list. When Dr. King shared his dream, he also asked the rest of the nation to think about their own dreams. Many of those dreams are still there, waiting to be realized. Not everyone can or should do everything. Not everything can be done at once. But this is a great country, one we’ve seen rally unbelievably behind the recent Haiti crisis. 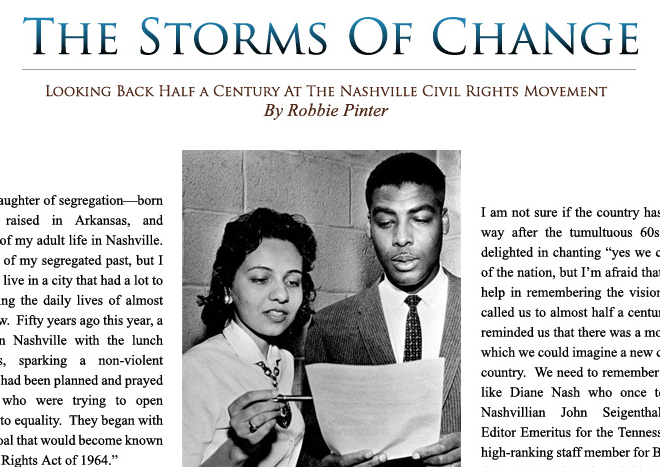 Nashville is a great city, one that played a significant role in the Civil Rights Movement and showed the world how non-violence could work in America. So now, when it’s time to wonder what you should do, consider Howard Thurman’s words: “Don’t ask what the world needs. Ask what you’re passionate about and then go and do it.” Thurman lived during the generation before the Civil Rights movement began.